It’s been a while since the old martial arts-drama has graced the screen like back in the early 90’s when Van Damme and Seagal were pumping out the same movie under different titles every 3 months. Maybe we have been itching for another after the long drought; or maybe they have still been making those films, only we like to pretend they weren’t. Regardless, get ready for the new sleeker and deeper martial arts drama without the household names of our past. There seems to be a different feel to Redbelt than most of its predecessors. Typically the martial arts genre relied of heavy action, stunts, and fight scenes to cover up the acting of leading men more fit for a robot-suit (Seagal) or ones we could only understand half the time (JC-VD). Not to mention the stories seemed to be constantly recycled with only minor tweaks (ie. leading guy is former CIA/FBI/policeman/martial arts expert/badass who is crossed by some former friend/partner/competitor and exacts revenge to save his wife/girlfriend/daughter/town). In that case, those films have only the action to be judged on, while the story and acting mostly serve as an unintentional comedic backdrop. 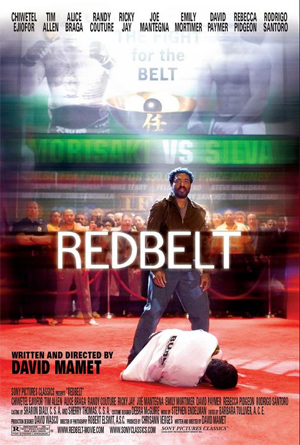 While there are many stark similarities to the aforementioned films, Redbelt still manages to stand on its own as more of a drama with martial arts, and not the other way around. I went into this film expecting, well, nothing really. I know it was geared toward the MMA crowd and barroom tough guys since Karate Kid and Bruce Lee are “out”, Chuck Lidell and Randy Couture are “in”. The problem there is that you had better be prepared for more thoughts, feelings, and martial arts honor-code, than you are for arm-bars and submissions. The difference here is that the film may have backed into something worthwhile, even if it was marketed as something entirely different than it is. The most astonishing fact is how little martial arts/MMA there are in the film. It starts out with a couple scenes and has a few more in the end, but nothing of the Matrix-style special effects or classic Seagal marathon-fight scenes. In fact, the only true “fight” is in the stadium tunnel on the way to the ring! Newcomer Chiwetel Ejiofor stars as Mike Terry, a Brazilian Jiu-Jitsu instructor who cares only about teaching his students real-world survival skills and what it means to be a student of the martial arts. He has more honor and sense of truth in his tooth than Van Damme mustered up in two-dozen films. He is a real guy who follows that code of honor, only it has done nothing more for him than stacked up unpaid bills and a lack of respect from his wife. Try not to pay attention to her abysmal performance (Alice Braga). Every time she spoke it felt like I woke up to Telemundo’s Soap Opera hour and couldn’t change the channel. But Terry stays true to his beliefs and won’t fight in competition because it “weakens you”. So when he saves Hollywood hotshot actor Chet Frank (Tim Allen) in a bar-fight he may have just gotten that big break. Frank tries to pay him back with gifts and a producer role, but as Terry soon finds out, nobody has the same good intentions as he does. There are some interesting twists of fate as the film progresses and I found myself pulling for this modern-day warrior. He must resort to the one thing he never wanted to do in order to help his family, except even that is not pure. After all events conspire against him, there is only one way out of the mess and it might mean compromising the last thing he’s got left, his honor. The biggest question is whether or not there is anyone else left who understands his values. While Terry puts on a solid performance as the lead, the action and fighting is somewhat subpar in quality. However, I think it lends more of an air of reality to it, instead of relying on high-flying stunts and guys who get blow-up that can still fight. Even though there are a ton of your typical cheesy karate-movie moments, there are more real emotions than in any other film of its kind. So while Redbelt may be the new fad of martial arts films packaged under a fancy new genre called MMA, it succeeds by going where its predecessors did not and simply could not. Interesting Cameo Appearance: Joe Mantegna (Agent David Rossi on Criminal Minds) as shady business manager/handler of Tim Allen’s character, Chet Frank. Mike Terry: I can’t help you Richie. Richie: You’re gonna help me, I’m gonna help you. Mike Terry: There’s always an escape.